Farm and Sparrow bakery in Candler, NC buys grain – especially Turkey Red hard winter wheat – from farmers, and grinds it to make flour, bread, and pastries. Ken and I visited Farm and Sparrow on our summer road trip, which we’ve also written about in posts about seed growers, breeders, and research stations, and most recently, using home-grown grain and why I care about locally grown grain. 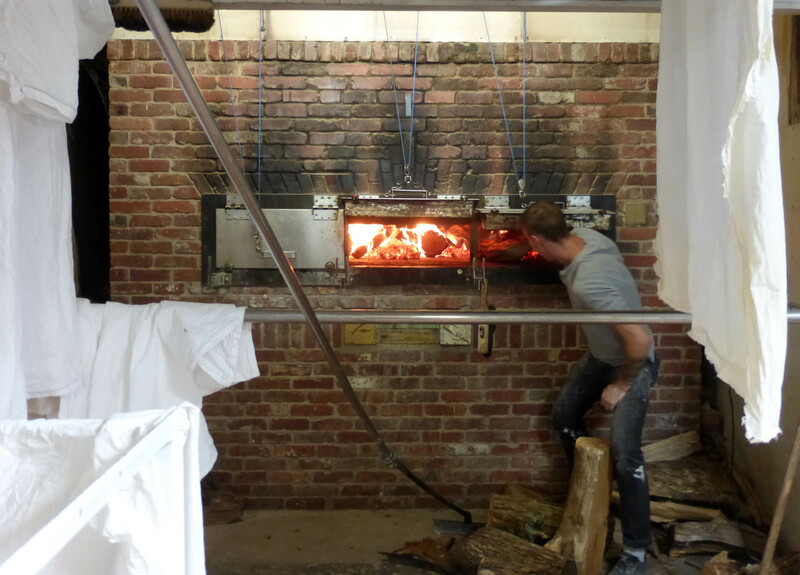 The crew of Farm and Sparrow bakes bread and pastries in a wood-fired brick oven. 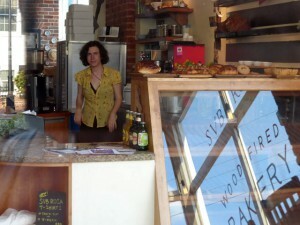 They sell to a local pizzeria as well as directly to consumers at several markets in nearby Asheville. 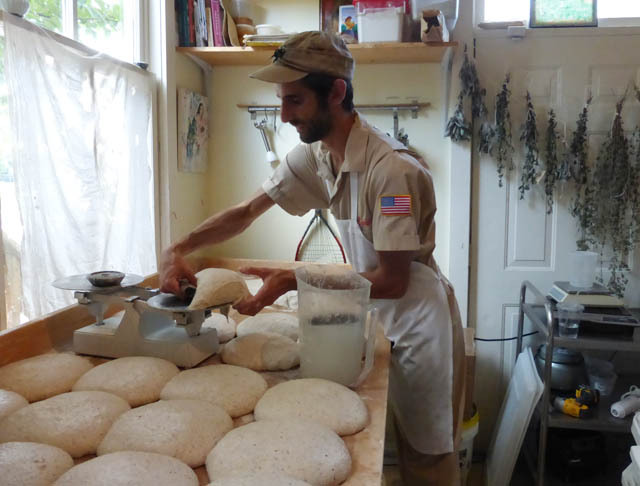 We greatly enjoyed the powerful fragrance of fresh flour in the milling room and the taste of their Heirloom Grit bread. We also visited two of the farms that Farm and Sparrow buys from. 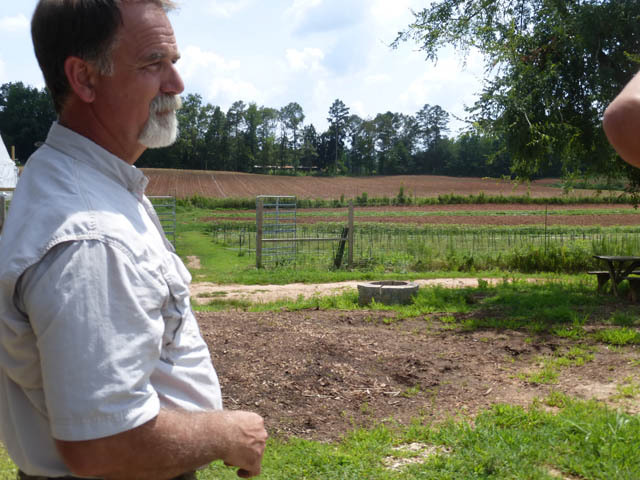 DaySpring Farms in Commerce, Georgia is operated by Murray Brett and his son Nathan. They grow Turkey Red wheat as well as NuEast hard red winter wheat, Appalachian hard white winter wheat, canola, corn, cowpeas, dry beans, and fresh vegetables. During our visit we picked up the Turkey Red wheat seed we’re now selling. Murray and Nathan are enthusiastic about growing corn and legume seed crops for us in the future, and we hope to line them up with some crops next year. The last stop of our two-week road trip was Looking Back Farm in the northeast corner of North Carolina. There, Kenny Haines and his son Ben grow corn, wheat, cowpeas, and soybeans, much of it for Anson Mills. They also do soybean trials for the Rural Advancement Foundation International. Kenny has been growing organically since 1987, long before organic food was popular. His wife was a nurse and insisted that their sons not be exposed to pesticides. Looking Back Farm was one of the largest farms we visited on our trip. They farm 350 acres, all by themselves, with more and more help from Ben’s sons. They’re precision tractor operators, planting and weeding and harvesting all their crops with their equipment. Like many of the farms we visited, they scale their work to their family’s labor, since it’s hard to find skilled farm workers who’ll commit to the work and the farm. When we had the opportunity a couple years ago, we were happy to buy some Iron and Clay pea seeds from them, but generally they grow no less than 10 acres of any crop. 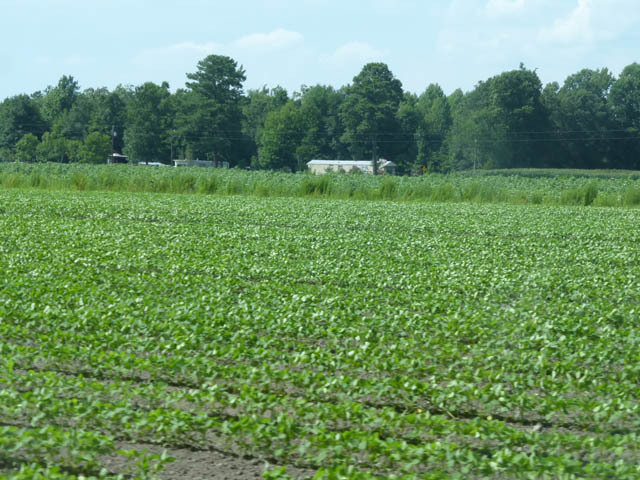 Southern Exposure’s inventories are small enough so that it would only make sense for them to grow seed for us if they were also growing the same crop for food or seed for someone else. We asked David Bauer of Farm and Sparrow if any other bakeries also mill grain and buy from farmers. He mentioned Sub Rosa bakery in Richmond, VA. When I visited Sub Rosa, baker Evrim Dogu was making Polenta bread with Bloody Butcher corn from our neighbor William Hale, who also grows seed for us. The sourdough loaf we bought was very crusty on the outside and very creamy on the inside. I usually prefer a more even-textured bread, but found this loaf deeply satisfying.